I as I mentioned in last week's class (multiple times), my laptop computer had a major crash earlier in the week -- and again right before class started -- which required me to restore it again from a backup. As of this weekend, I've managed to get the system working again without as much data loss as I'd feared. 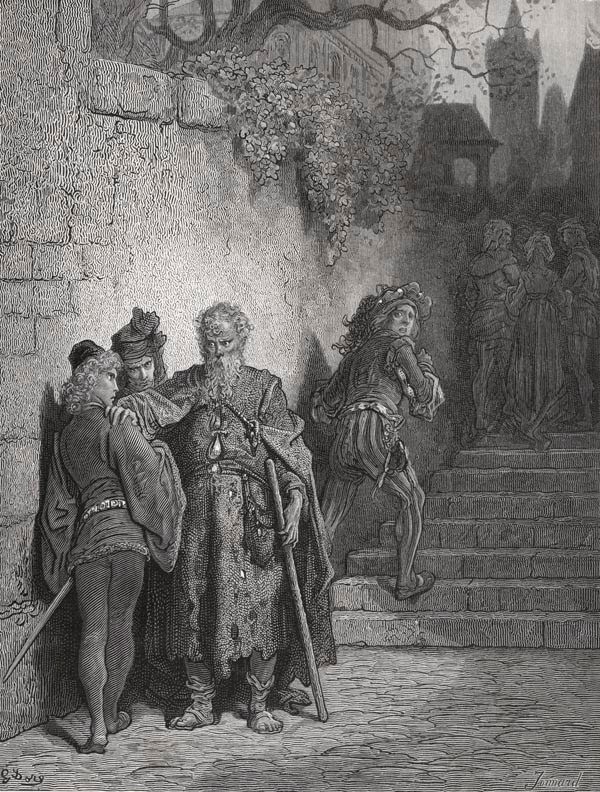 Still, in the interval between the crash and restoration, I felt a little like the Ancient Mariner from Samuel Taylor Coleridge's famous poem (pictured here in one of Gustav Doré's engravings from an 1884 edition), sharing my tale of woe with all who'd listen, in the hope of saving others from my terrible fate. After our class in the Fisher Library, I reflected on the juxtaposition of my dying laptop with the rare books we were looking at, especially the parchment codex and scroll, whose material substrates were even more durable than the paper books from the 18th and 19th centuries that we examined. However, I stopped short of the standard criticism of digital technology, which is that printed and manuscript books, unlike digital texts, remain readable centuries after their creation. Here's the twist: how many of us in the room could actually read the 13th-century manuscript book of Lombard's Sententiarum (written in medieval Latin, with some Greek marginalia), or the late 16th-century Esther scroll written in Hebrew? Even if we had enough Hebrew or Latin to parse out the words in sequence -- which is conceivable given the range of backgrounds in the class -- does that mean we actually know how to read these books as objects, in all their formal complexity? For those of us who feel that our digital books are as vulnerable as the Ancient Mariner's ship on a storm-tossed sea, one lesson of this story is that there's hope for the future of reading if people like Justin Gawronski care this passionately about their digital books, and don't sit idle when the waves start washing over the gunnels. However, Amazon-bashing by itself doesn't get us anywhere with respect to the main questions of our course. So, returning to my original question -- what difference do books make in considering digital preservation and loss? -- in this case another lesson is that e-books are not stand-alone objects, but may be annotated just like print and manuscript books. And like those non-digital books, the annotations can make the original object uniquely valuable, even irreplaceable -- think of Samuel Maude's 1792 diary written in the margins of Samuel Jonson's Plan of an English Dictionary. So, here we have at least one difference: unlike mp3 music files, downloaded movies, or video games, digital books can be annotated, and preserving those notes matters. What are some of the other ways that taking a book-centric perspective on digital preservation (including reading activities related to books, like annotating, bookmarking, etc.) can help us think about the digital artifacts we hope to preserve, and the nature of preservation itself? Feel free to interpret this question broadly, and to approach it from angles I may not have thought to suggest here. 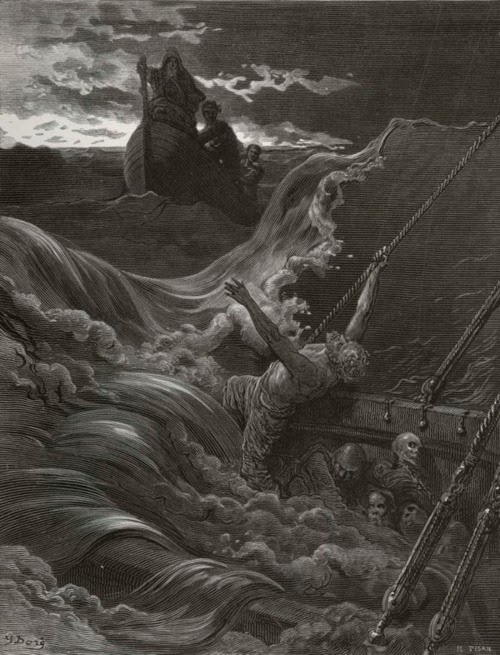 Btw, if you're unfamiliar with Coleridge's "Rime of the Ancient Mariner" and would like a relatively quick overview, here's the modern adaptation that introduced me to Coleridge and to poetry itself a long, long time ago. PS: Back up your data. Seriously. Like right now, before you do anything else. You'll thank yourself later, trust me. 2331 Future of the Book | Collectively blogging about the future of the book! follow up to "E-Books, Part 2"